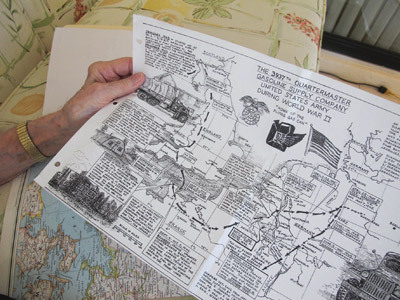 Murray Cashdollar holds a hand-drawn map that was created after World War II, with the help of a serviceman’s son and notes supplied by Cashdollar and others. It shows a timeline of the war experienced by the 3937th Quartermaster Gasoline Supply Company, U.S. Army. Lia Martin photo. Documenting World War II was often done by those involved in the war as combatants and support crews. They wrote memoirs, journals, drew maps of their journeys or wrote books. Others living in that time period wanted to put some kind of cohesive order to the war that followed on the heels of World War I, so they spent time verifying battles with eyewitness reports and bits of written histories. Sun City Center resident Murray Cashdollar served in the Army in World War II from 1943 through 1946. He served as a quartermaster working in petroleum supply. Through his work as an administrator, Cashdollar helped supply the tankers, planes and all other military equipment with the gasoline they needed to fight their battles. Iris Rowe at 80 years old lives in Somerset in the United Kingdom. She is a military historian who has been communicating with Cashdollar since 1998. They have had a long-distance relationship hashing out the events and history of World War II. Rowe recently sent Cashdollar a special newspaper tabloid from Somerset on World War II. Western Daily Press compiled the 16-page tabloid with the headline “D-Day: The West Country remembers.” It is evident in the newspaper articles that the people of Great Britain feel they owe our government for helping them protect their country during World War II. “They were appreciative of our involvement,” Cashdollar said of our country’s contribution to England during the Second World War. 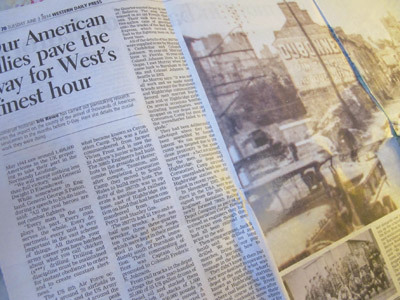 The article, “Our American allies pave the way for West’s finest hour,” written by Iris Rowe for the Western Daily Press in Somerset, United Kingdom. The paper “D-Day: The West Country remembers” was sent to local resident Murray Cashdollar. Lia Martin photo. On May 8, Cashdollar received recognition from the U.S. Army Quartermaster Museum in Fort Lee, Va. Luther Hanson, museum specialist, wrote a letter to Cashdollar thanking him for a filled three-ring binder of historical data and information sent to them on World War II. Cashdollar said when he returned from the war, he followed his father’s example and put together all the details and mementos of that war as his father did before him. Cashdollar’s father served in France in World War I and kept a log of what happened in his wartime experience. Cashdollar sent his materials to the museum, and he later took his father’s log and sent the documentation of World War I to the museum as well. Cashdollar and his brother Wayne were taught by their parents to think about the current events surrounding their lives as young men. Raised in Pittsburgh, the boys’ parents did not like the fact of World War II, but realized the necessity of it. Roosevelt was not able to help Churchill as much as he would have liked because America was fighting against the Japanese at that time, according to Cashdollar. What Roosevelt made happen was once Henry Ford finished airplanes to be used in the war, every single one of them were sent to England as they came off the assembly line. They were flown stripped down. The guns and other military equipment were shipped over and added to the planes there, after they arrived in England. Cashdollar was drafted into the Army at 22 years old. After he was drafted and serving at Fort Jackson, S.C., for boot camp, he found that many of the draftees had come from his hometown. Most draftees had just come out of high school, Cashdollar said, but there were also 35-year-old men assigned to the 3937th Quartermaster Gasoline Supply Company, U.S. Army. Cashdollar explained that the Army had a quota to fill from each geographical territory, so sometimes older men, who might be married without children, were included. “I was what you would call a lucky fella,” Cashdollar said of his assignment in the Army. He served as an administrator in the office, which prevented him from much of the physical work on the front lines. His division followed Patton as he pushed the Germans back through France and Belgium. They supplied the petrol Patton and his men needed on the front lines. Cashdollar said when the “invasion” began from the Germans, they were working around the clock, no matter what their job was. One night, Cashdollar said, in Liege, Belgium, the Germans began bombing and continued from Nov. 15, 1944, through March 1, 1945. It became known as the Battle of the Bulge. During the early bombing, they lost 500,000 gallons of gas. They used German prisoners of war to move as many barrels as they could before they caught fire. After the war, Cashdollar moved back in with his parents. He worked and finished his degree in business administration, after many years. His first “real” job was a production control supervisor in a factory that made the containers in which food was shipped. By that time, he was 38 and had never married. His father died and Cashdollar lived with his brother Wayne and his mother in Pittsburgh. They worked and they traveled together to the Grand Canyon, Yosemite, parts of California and Europe, experiencing many wonderful times. They moved to Sun City Center in 1988. Cashdollar misses Wayne, who died seven years ago. However, he reads and corresponds with Iris Rowe on the facts surrounding World War II. Next year, a book is coming out about World War II and she is going to make sure that Cashdollar receives a copy of the book.